News – Regatta München e.V. Attention Masters: Get your calendars out and save the date! 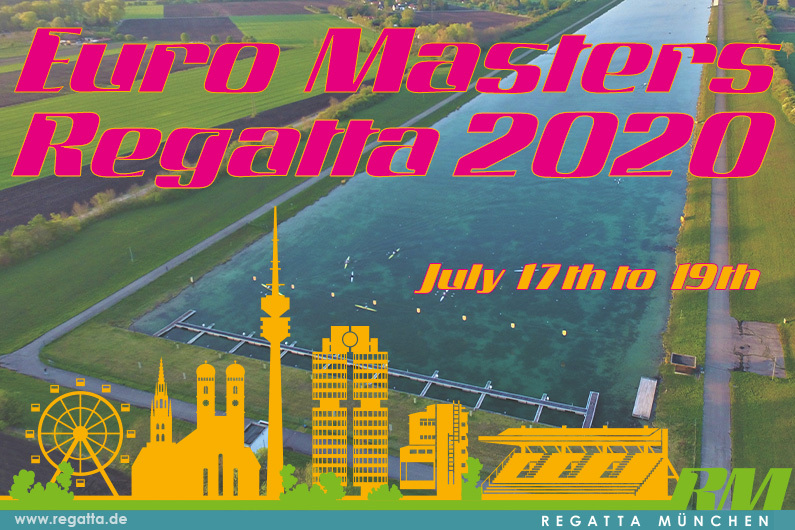 Euro Masters Regatta 2020 is confirmed to take place from July 17th to 19th, 2020 at the Olympic Regatta Course in Munich-Oberschleißheim. From eights to singles, all events and age groups will compete for medals again on the 1000-metre course under the expected fair conditions. Like in previous events, Regatta München again expects more than 2,000 rowers from all over the world. In 2018, Russia, the Netherlands, Great Britain, Austria, Czech Republic, Denmark and France were represented. But athletes also travelled to Munich from as far as the USA, Canada, Argentina, Hong Kong and Japan. To facilitate racing for athletes from all over the world, there will be a boat rental again. In terms of accommodation, there will be camping sites open along the course as well as special offers to be booked through Hotel Verbund Munich. Updates will be published continuously here on the website and on Facebook. In addition to perfect organization on the water, the organizers are already fine-tuning the concept on land: the culinary offer will again be regional and suitable for athletes, without losing sight of the fun of a cool beer or a delicious ice cream. At the same time, the Regatta Munich team is working on new ideas for more environmental protection and an unforgettable Masters Party on 18 July. Another novelty is that the Bavarian Rowing Championships will be integrated into the Euro Masters Regatta for the first time. In special racing blocks, which are only open to Bavarian clubs, the state champions 2020 will be determined. 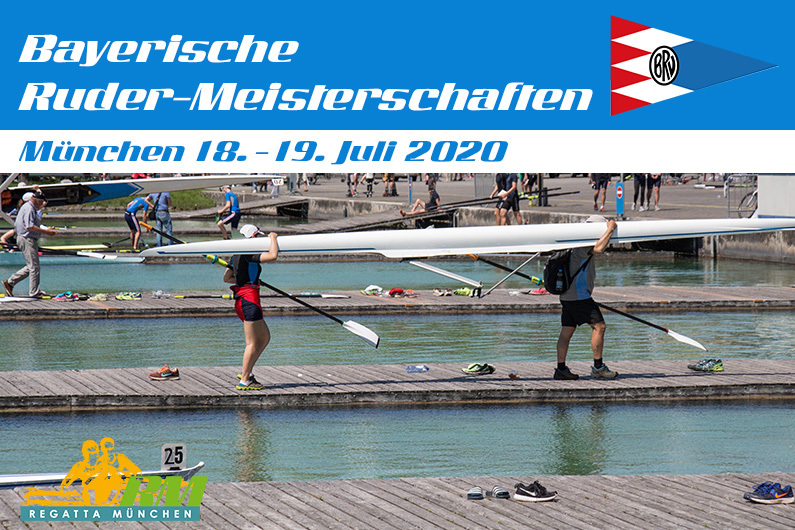 All regatta information for Euro Masters Regatta 2020 and the Bavarian Rowing Championships 2020 will be published on the Regatta Munich website as soon as they become available. If you want to find out more about the details of the Euro Masters Regatta 2020 in person, come visit us at the Regatta München booth at the World Rowing Masters Regatta 2019 in Velence, Hungary. After the three hopefully successful race days you deserve a big party. 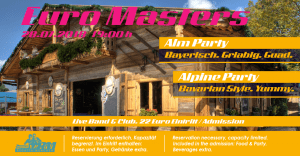 2018 we celebrate the Euro Masters Alpine Party with you – Bavarian style & yummy! In our original alpine cabin with adjacent beer garden and tent (insiders remember the epic rain of 2014 – we are prepared!) we welcome you with hearty brass music and tasty Augustiner beer. From 7 p.m. Bavarian braised beef with side dishes or the vegetarian alternative will be served. And then it’s party time with our Big Band – think Oktoberfest fun! And if you can’t get enough of dancing, stay until our Alpine Club DJ makes the hut shake. Attention: Space is limited – so secure party tickets quickly! The entrance fee of 22 Euro includes dinner and the party with live band and the Alpine Club. You will have to use your login data from previous race entry bookings or register from scratch. Once in the system, click on the button ‘Show overview’ below the Euro Masters Regatta 2018 logo. Click on the button ‘Select additional services’ and select your dinner option for the party by inserting the number of participants you would like to book for. By clicking on ‘Select additional service’ you will be presented with the check-out page where you can make your payment for the additional service. The entrance fee of 22 Euro includes dinner and the party with live band and the Alpine Club. Drinks are not included. If there are any tickets still available at the regatta, they will be sold for 7 Euro for the party only, entrance after 21:00 h.
After some discussions as well as many thoughts and due to popular demand, we are going to introduce lightweight races at the 2018 Euro Masters Regatta for the first time. Sample: Race 203 MLW 1x D will take place on Friday and has 6 regular divisions. Race 203L MLW 1x Lightweight will immediately take place after the last of the 6 regular divisions and before race 204. A lightweight male single sculler may not weigh more than 72.5 kgs. A lightweight female single sculler may not weigh more than 59 kgs. The weighing scales should indicate the weight of the rower to 0.1 kg. Lightweight rowers shall be weighed wearing only their racing uniform on tested scales not less than one hour and not more than two hours before their first race of each lightweight event in which they are competing, each day of the competition. The Control Commission shall require presentation of each rower’s official identity card with photograph at the time of the first weighing of the rower and subsequently. A rower not meeting the required weight may be weighed again any number of times within the allowed time limit. However, if a rower fails to meet the required weight or does not present itself by the expiry of the time permitted for weighing, the rower is no longer eligible and shall be excluded from the event. This means that you need to be weighed several times each day, if you decide to participate in multiple lightweight races in one day or on separate days. This also means that you are not automatically entered for the regular non-lightweight race in case you do not meet the lightweight weight criteria and that you will be excluded from racing, if you were not weighed before the race. There will be no separate trophy races for lightweight rowers. Lightweight rowers, who row in the lightweight races, are considered for the relevant 1x event in their age category, if they belong to the six or seven fastest participants in that specific event and age category. Please note: There is no weigh-in for the Munich Masters Trophy races. If you have entered your boat in MAX already in the regular race, you can either notify us and we will modify your entry in the system or you can cancel that entry and make a new entry for the relevant race marked with the “L”. All entries made before the early-bird deadline, either done for the regular or the lightweight races, will be considered for the early-bird discount, even if we change the race to lightweight afterwards, no worries. Regatta München e.V. partners with Filippi, the Italian racing boat manufacturer, for the Euro Masters Regatta 2018. Filippi will be premium partner at the international regatta at the Olympic regatta course in Munich from July 26-29. The event will attract more than 2,500 rowers between 27 and 80+ years from 25 countries. In particular, the sponsorship agreement will be beneficial to all participants travelling to Munich from far way: Filippi will not only offer repair services for his customers but also an extensive boat rental at the regatta, eliminating the need to bring own boats. 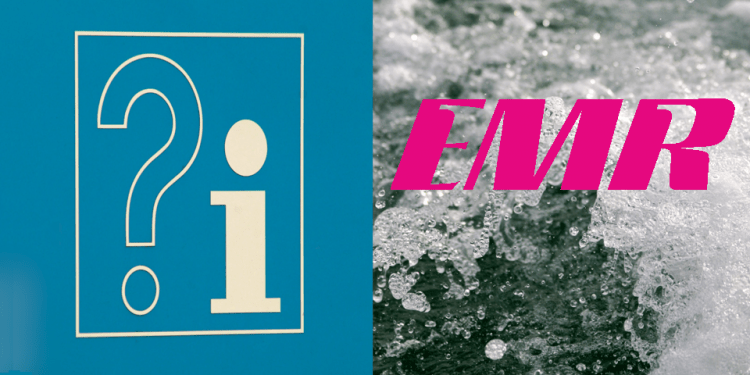 “Filippi is a trusted brand amongst masters rowers. We hope that the boat rental will facilitate competing in Munich for all rowers who cannot bring own boats,” says Oliver Bettzieche, president of Regatta München e.V. Traditionally, master rowers get together once a year to compete at World Masters. Every fourth year, the regatta takes place in a non-European country. This year it will be in Sarasota, Florida/USA. The Euro Masters Regatta in Munich is both a performance benchmark for European athletes competing in Sarasota in September as well as an alternative for those athletes who do not want to travel overseas. “Our goal is to provide professional rowers with high quality boats while giving them the opportunity to have a great time together. We are proud to be part of the Euro Masters Regatta 2018 in Munich. This is the best place to meet Masters from all over Europe,” says Maria Guerrazzi, responsible for Filippi Boat hire at master regattas. 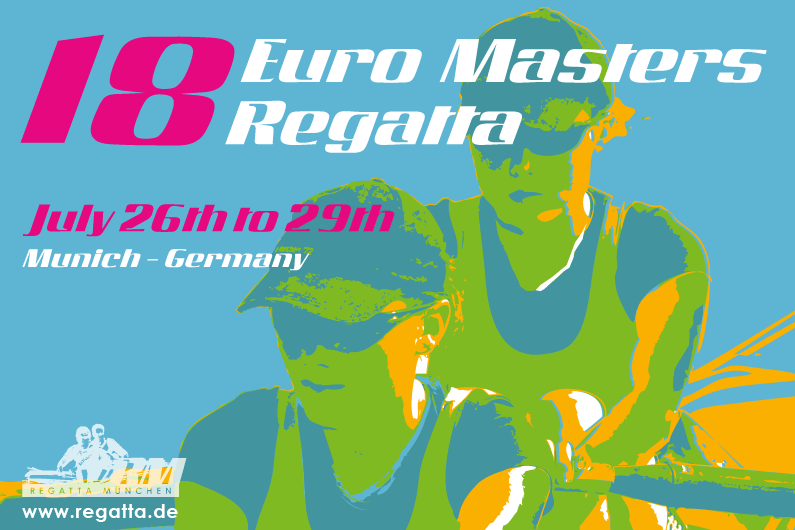 Entries for the Euro Masters Regatta are open until July 4, 2018. Rental requests for singles, doubles, pairs, fours, quads and eights should reach Filippi preferably until June 30. Rental fees are Euro 40.- per race and seat, additional rent will have to be paid for practice sessions. For further information about the regatta and the boat rental, please visit http://www.regatta.de/. Regatta München e.V. has been founded in 2013 to continue to host the traditional, successful international rowing regattas at the Olympic regatta course from 1972. The association builds on dedicated individuals, rowing and canoeing clubs, sport enthusiastic enterprises as members as well as on volunteers and kind partners to organise the events. Regatta München e.V. is a member of the Bavarian Rowing Association and the German Rowing Association.